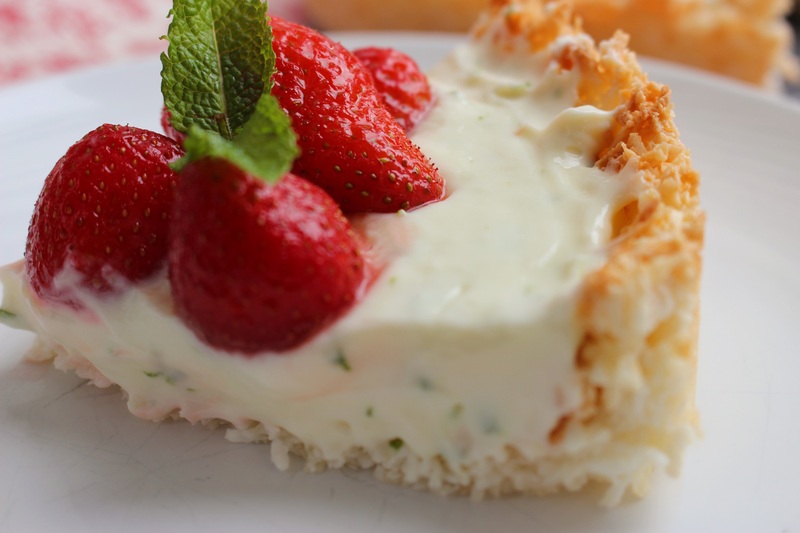 Coconut, lime and strawberry tart | dash.drizzle.dollop.devour. 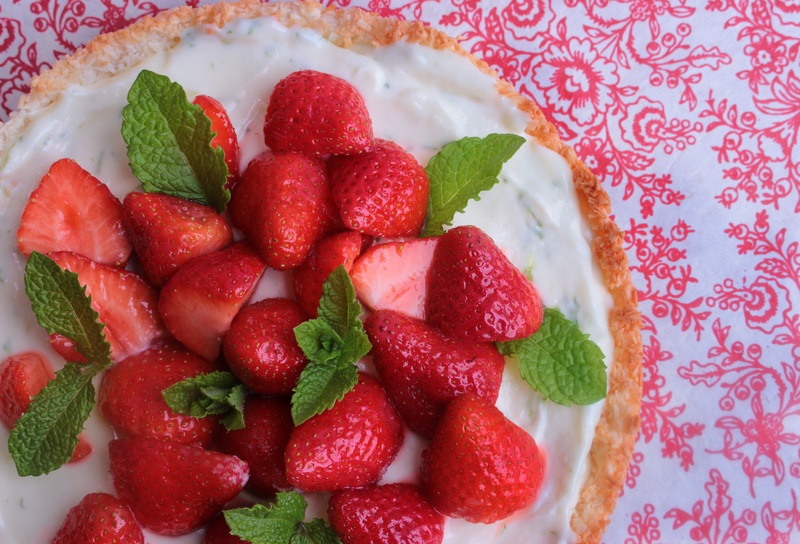 A tropical twist on a summery strawberry tart. This looks and tastes like far more effort than it actually involves; no-one would ever believe that it was borne of series of compromises on a day where I wanted to make something, but everything seemed like too much trouble. Sometimes I just find myself in the supermarket ambling around aimlessly, without a shopping list and without a clue what I want to cook. There were punnets of new season strawberries which made their way into my basket, but otherwise I was feeling hopelessly uninspired. Maybe I could put them in some sort of tart…no, not in the mood for making pastry…maybe with some victoria sponge and cream…no, a bit boring…. So as I drifted up and down the baking aisle, suddenly a bag of desiccated coconut caught my eye and it all fell into place. I thought I’d experiment with using a coconut macaroon mixture instead of pastry to make a tart shell. It requires a fraction of the time and effort of making pastry, yet gives the impression of being a much more ambitious and exotic endeavour. Combining the coconut with a zesty lime filling gives the whole thing a pleasingly tropical feel. Even the lime filling was a bit of a shortcut in the end. I had initially intended to make a lime curd with the leftover egg yolks, but again that felt like too much of an undertaking, so the egg yolks were abandoned in the fridge in favour of a simple creamy filling made from condensed milk and whipped cream instead. Start by making the tart case. Preheat your oven to 150C (fan). Lightly but thoroughly grease a 20cm loose bottomed round tin. This mixture can be pretty sticky, so a good non-stick tin will help immensely. Mix together 1 1/2 cups of desiccated coconut, 2 egg whites and 1/4 cup of caster sugar. If you pick up a clump of the mixture and give it a squeeze it should clump together nicely. If it seems a bit wet add a little extra coconut. Press the coconut mixture firmly into the base and sides tin as evenly as you can. Bake for 15-20 minutes until light golden and set. Leave to cool then release the edges from the side of the tin. Meanwhile decant a 400g can of condensed milk into a mixing bowl. 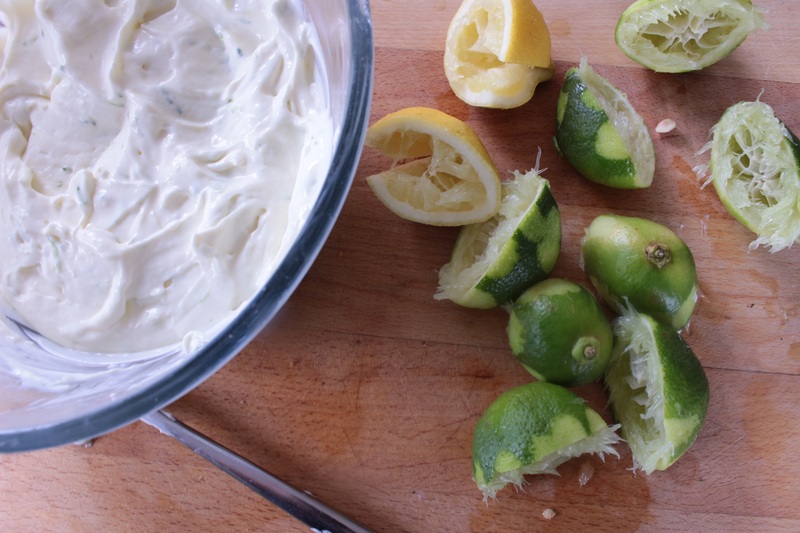 Add the juice and zest of 4-5 limes until the mixture has a good balance of tangy yet sweet to suit your taste. It’s very hard to know how much juice will come out of each individual lime, they can so often be disappointingly dry. I ran out of limes before I’d obtained the requisite sweet-sour balance, so ended up adding the juice of a lemon too to get the balance right. Lightly whip 200ml double cream until it is just thick and voluptuous, forming gentle sloppy peaks. It will thicken up further once added to the citrus juice, so don’t worry about it being too runny. Stir it into the lime mixture and its done. Pour it into the cooled coconut case and put it in the fridge to chill and set for an hour or so. A little while before you are ready to eat it, macerate a punnet of strawberries in the juice of half a lime and a good spoonful of caster sugar. Leave to meld for half an hour or so before tumbling them on top of the tart. As any dedicated mojito drinker knows, mint is excellent paired with lime, so a few sprigs on top bring extra flavour as well as making the whole thing look pretty. So there you have it, a chewy, sweet coconut macaroon tart, with no more than half an hour in the kitchen. A word on storing this – as time passes the coconut will slowly absorb some moisture from the cream and soften a little, which can make for slightly messier slices after a day or so.